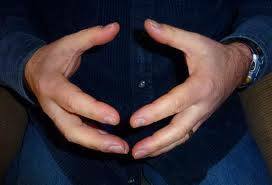 "The simplest Qigong practice I know of is forming a Qi-Ball. The palms should be rounded and relaxed as if holding a large grapefruit. The fingers should be aligned fingertip to fingertip. Because of the different polarities in your palms, after a few minutes, you should be able to detect the growing presence of Qi-Energy between your palms. You are forming a Qi-Ball. Not sure? Stand before a mirror while wearing a black shirt. Watch the space between your hands in the mirror. A subtle sky-blue light will be present... The fingers will create streamers of energy--lines of silver-blue--connecting the fingertips; like playing Cat's Cradle with Qi instead of string. This exercise has been called La Qi. It is a sensitivity training exercise that I teach beginners so they can detect the presence of Qi right away. What I have noticed after years of teaching is that some students feel the Qi right away, while others seem better at seeing the energy. Open and close. Open and close. Breathe in while opening and breathe out while closing. Move your palms at the speed of your breath. Once you have crated a strong sensation of Qi, once you KNOW you have created a Qi-ball, press the energy ball into your body. Ideally, press the Qi-ball into any area where you are experiencing pain. If nothing hurts, then perhaps press the energy into your heart or into your navel or your third eye... Your hands will likely feel extra warm, especially in the very centers of your palms. A very simple but profound Qi exercise..."